How to change PS3 Slim or PS3 Supper Slim hard drive to larger one in Windows 7/8/10? Here, we will introduce you the best free hard drive cloning software-AOMEI Backupper Standard to resolve. The PlayStation 3 (PS3) as the successor to PlayStation 2 is a home video game console developed by Sony and released in 2006. Then PlayStation 3 Slim was released in 2009, which is lighter and thinner than the original version, and no longer provided the hardware ability to run PS2 games. After three years later, the PS3 Super Slim was published. Therefore, the PS3 series products include PS3, PS3 Slim (120GB, 250GB, 320GB, 500GB, etc.) and PS3 Super Slim. Therefore, PS3 Slim and PS3 Super Slim are the most popular game consoles among these devices and they are our main topic today. Why Change Hard Drive for PS3 Slim? In the view of PS3 Slim characteristic, you can download large games to play, watch videos on that device. But with the daily use, you will find the PS3 Slim hard drive capacity is not enough for storage. Thus, it’s easy to think that changing PS3 Slim hard drive to larger one is the best way to resolve this issue. Before you replace hard drive for PS3 Slim to SSD/HDD, there is something you have to prepare. Since the PS3 can only detect FAT32 file system hard drive, you have to format the HDD or SSD drive to FAT32 to make sure it can be recognized by Windows. To change PS3 Slim hard drive to larger one, you have to take out the PS3 Slim hard drive carefully with the extracting tool. On the other hand, you should take advantage of hard drive cloning software to do PS3 Slim hard drive replacement. 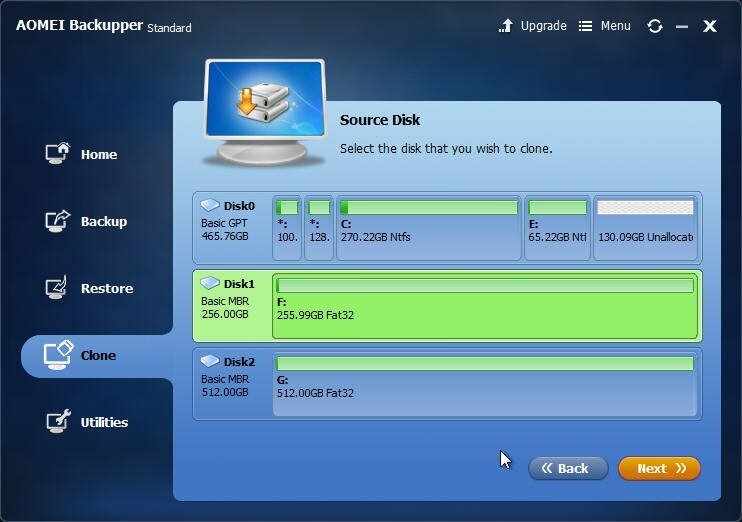 In our article, we will give you the best free disk cloning tool-AOMEI Backupper Standard to have a try. This software is highly recommended by home and professional Windows users due to its comprehensive functions and intuitive interface. How to Change PS Slim Hard Drive to Larger One without Losing Data? AOMEI Backupper Standard offers two solutions to change PS3 Slim hard drive: backup PS3 Slim hard drive first, then restore data to the destination hard drive; clone PS3 Slim hard drive to larger HDD or SSD. Comparing these two ways, you will find the later one could be better. The two ways also apply to PS3 Super Slim. Thus, following words are describing the details about cloning PS3 Slim hard drive to larger hard drive. Above all, please free download AOMEI Backupper Standard on your computer, install and run the software; then insert the two hard drives, one is PS3 Slim hard drive, the other is the target hard drive (HDD) or SSD. 1. 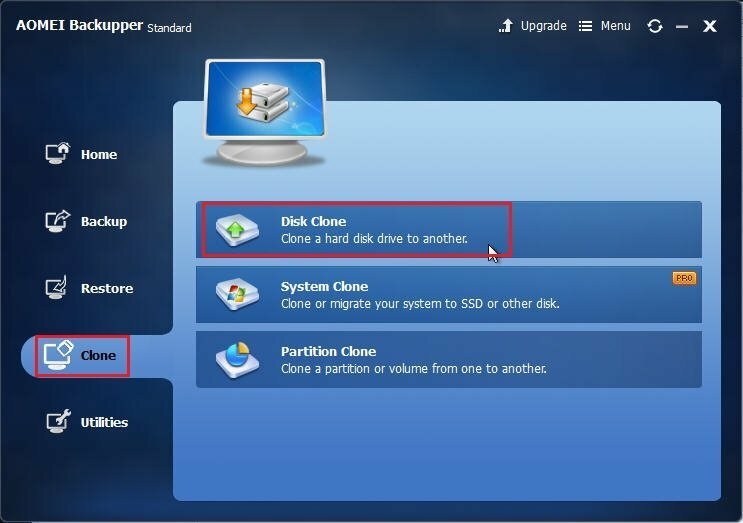 To change PS3 Slim or Super Slim hard drive to 500GB or larger one, on the main window of the freeware, choose Clone->Disk Clone in turn. 2. In the next interface, choose the PS3 Slim or Super Slim hard drive as the source disk to clone. 3. 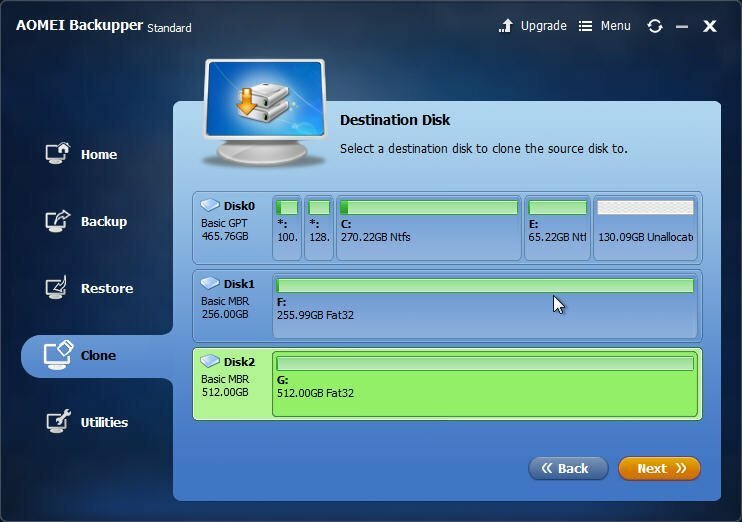 Select the larger HDD or SSD as the target location to store all the data from PS3 Slim or Supper Slim hard drive. Tips: The destination disk will be overwritten after the operation, please backup data on that drive in advance. 4. Click Start Clone to upgrade PS3 Slim or Supper Slim hard drive to larger HDD or SSD. 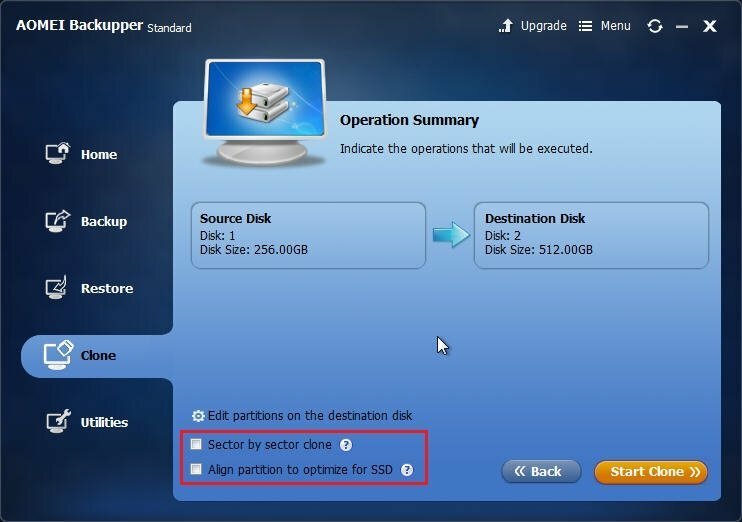 Tips: If your target disk is an SSD, please check the option of Align partition to optimize for SSD. Well, you should be aware of the cost time depending on the data size of source disk, wait for a few minutes, the operation will be finished. In addition, AOMEI Backupper Standard allows you to clone individual partition to other location, like external hard drive, local disk, NAS device, network share, even the cloud. The Professional edition provides more features like system clone, real time file sync to network path, restore to dissimilar hardware computer, and more.